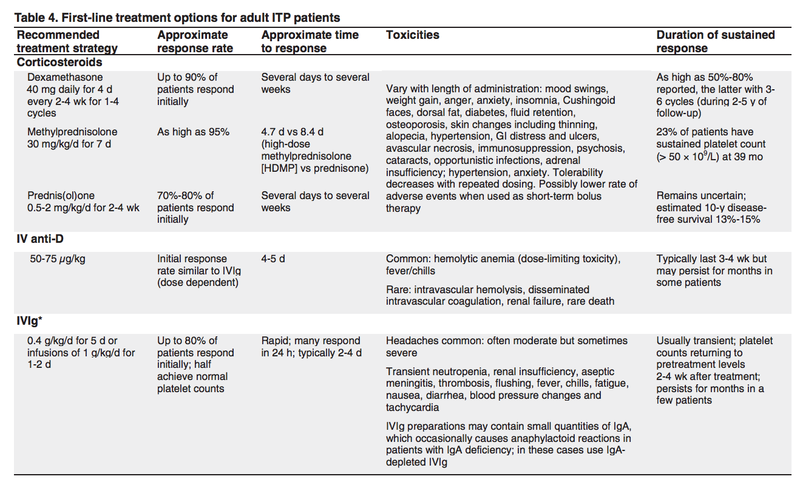 There are several treatment options for ITP. The primary goal when you are getting treatment for ITP is to have guarantee a healthy platelet count and prevent bleeding complication while maximizing side effects. Children with idiopathic thrombocytopenic purpura ordinarily can improve without the need for treatment. Nearly 80 percent of children with ITOP recover completely within six months. . Children, who have chronic, have complete recovery years later, although it may occur years later. In situations with adults, who have mild cases ITP, only regular monitoring and platelet checks may be required. However if there are symptoms that are worrying or difficult, and you have a consistently low blood platelet count, you may want to speak to your doctor about a treatment plan. There are options for treatment, which usually consist of medications and sometimes surgery (splenectomy)_. Your doctor may want to discontinue giving you certain medications that inhibit platelet function and growth such as aspirin, ibuprofen (Advil Motrin IB and others0. Also, blood-thinning medication such as warfarin and Coumadin would set back the improvement ITP. Corticosteroids are typically the first step in TIP therapy, usually prednisone, this help increases the platelet count by decreasing the activity of the immune system. After your platelet count is normal levels again. You can gradually reduce and stop the dosage of the drug under the guidance of your doctor. The treatment time frame for this is about two to six weeks. The challenge that many adults face relapses after they discontinuing taking corticosteroids. A new round of corticosteroids may be implemented. However, it is not recommended that these medications be taken for long-term use because there is a risk of severe side effects, such as wieght gain, high blood sugar, cataracts in the eye, increased risked of infections and loss of bone calcium that can lead to osteoporisis. You should talk to your doctor about the benefits and risk to see what the best course of action is. If you do proceed with taking corticosteroids long-term, you doctor may ask you to take calcium and vitamin D supplements to help maintain bone density. Thrombopoietin receptor agonists: Romiplostim (Nplate) and eltrombopag (Promacta) are some of the newest types of medications that treat ITP. These drugs help your bone to create more platelets. More platelets contribute to reducing bruising and bleeding. There are a few side effects such as muscle pain, joint pain, vomiting and nausea, headaches dizziness and increase the risk for blood clots. Biologic therapy – Rituximab (Rituxan) helps \ decrease the immune system response. If corticosteroids do not help, or someone has severe ITP, A doctor will prescribe the use Rituximab. The side effects include fever, sore throat, low blood pressure and possible rashes. In adults who have severe ITP and an initial treatment of prednisone does not help. Surgical removal of the spleen is called a splenectomy, Removal of the sleep can quickly eliminate the primary source of platelet destruction and possibly increase the plateket rpfouction. However, these treatment does not work for every. Splenectomy for ITP patients is not as common as it once was due to serious post-surgical complications. Also not having a spleen permanently increase a person sensitivity to form infection. Emergency Treatment – Severe bleeding can occur in an individual with ITP regardless of age or platelet count. Although this is rare, serious and, extensive bleeding demands emergency care because, it is life threatening. This usually includes blood transfusion and or platelet concentrate, intravenous methylprednisolone (corticosteroid) and intravenous immune globulin. Other Treatment Options – If the initial treatment of corticosteroids or a splenectomy has not worked to help a patient go into remission, a doctor may recommend another course of corticosteroids. Immunosuppressant Drugs – are medications that suppress the immune system. Drugs like cyclophosphamide (Cytoxan) and azathioprine (Imuran, Azasan), are used to treat people with ITP. However the can cause notable, and the effectiveness is not yet proven. Side effects can include low blood pressure, dizziness, headaches, hair loss, nausea, and vomiting. H. pylori treatment is used for people who have ITP as well as being infected with Helicobacter pylori. This bacteria also causes peptic ulcers. Eliminating the bacteria help increase the platelet count in some people however results re not consistent. Because of the potential serious complications with treating ITP, it is critical to discuss all treatment options with your doctor to understand the risk and benefits of the different options available. Sometimes the sided effects can be more burdensome than the disease itself so it important to comprehend this factors before proceeding with treatment. In cases of emergency care, it’s important to seek medical care immediately. ← What is an Appendicitis?